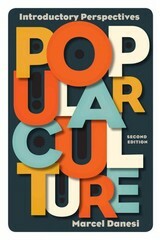 Popular Culture 2 Edition Pop culture surrounds us. Its products are the movies we watch, the music we listen to, and the books we read; they are on our televisions, phones, and computers. We are its fickle friend, loving to hate it and hating to love it. But what, exactly, is it? Popular Culture: Introductory Perspectives seeks to answer that question by exploring our human desire for meaning and the ways that pop culture embodies meaning for us. In this text, Marcel Danesi delves into the social structures that have led to the emergence and spread of pop culture, showing how it validates our common experiences and offering a variety of perspectives on its many modes of delivery into our everyday lives. The second edition offers analysis of current contexts for popular culture, including the rise and dominance of the digital global village through technology and social media, as well as up-to-date examples that connect with today s students."